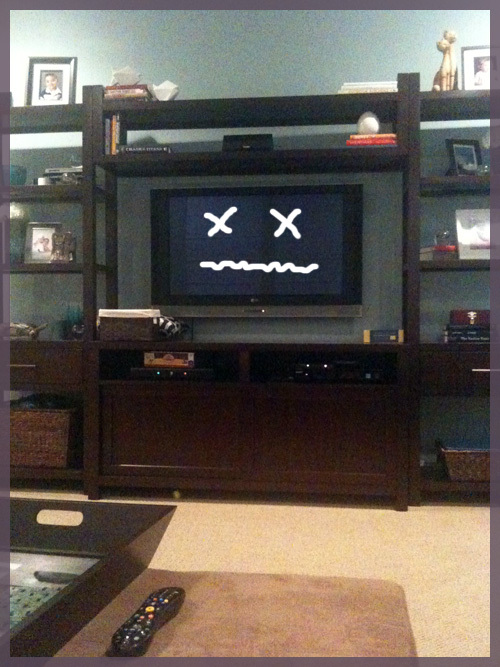 I told you on Thursday that our beloved family room TV had died right then and there, as I typed my post. By Friday, it was still dead, but I stared at it anyway. I had a long week last week and I really did not want to spend Friday night TV shopping. I thought maybe I could just lay down and relax by the dead TV, but I lasted about 20 minutes before we headed out. 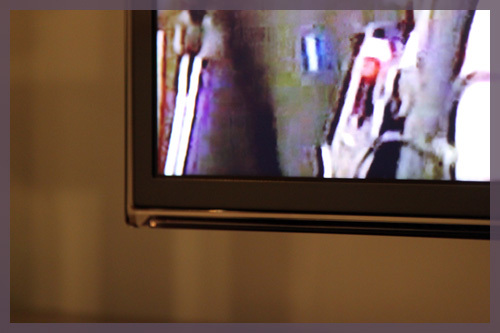 Here we got a nice introduction to the TVs of 2011. They are a) thin b) sleek and c) way cheaper than they were in 2005. I should have started this post by saying that we are not normal blogger people. 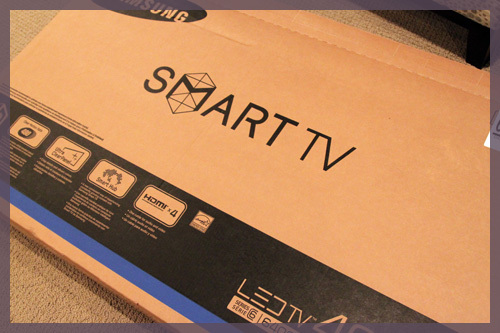 We are sometimes irrational and decide to buy a TV on a whim. Hey, we’re human and we like electronics. One person’s Missoni is another person’s Samsung 🙂 We also like TV and accept the fact that it is the focal point of our family room. That being said, it had to be pretty. 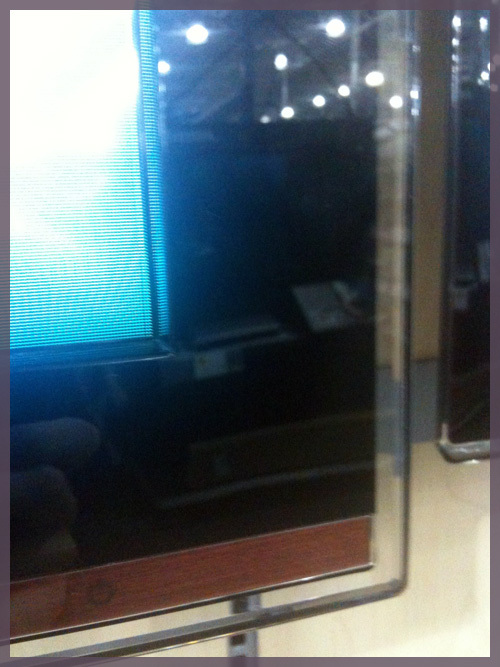 The few times I’ve seen TVs in the past few years I’ve loved these Samsung ones with the glass frame. Other than that, we were not impressed with anything at Best Buy, so we headed to stop #2. Woohoo! You had me at hello! 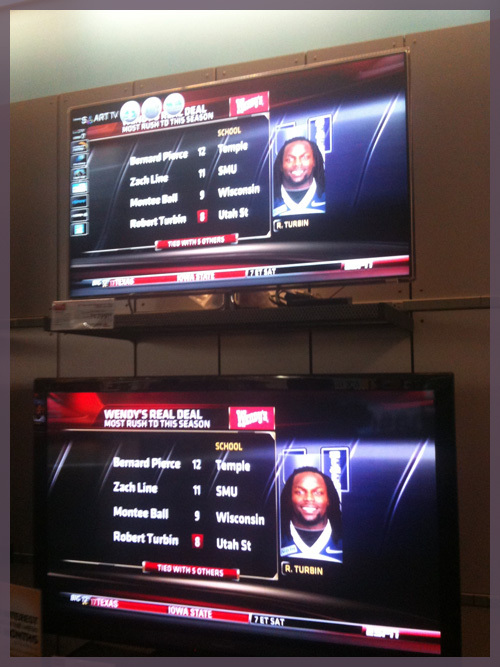 hhgregg also had the most beautiful TV I have ever seen, it was basically frameless and the image extended all the way to the ends of the TV. Here it is on top, compared to a TV with more of a frame. But it was expensive, so we traveled to the open box section which had a bunch of great deals. 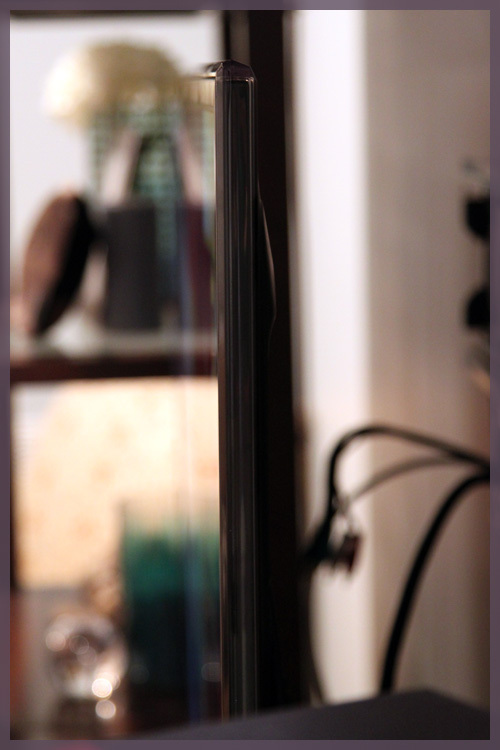 We could get a 46″ pretty glass framed TV for $900. We’ve bought numerous open box items before, so this didn’t bother us in the least. However, we decided to look around a little more. I believe this is a regional store, but I wasn’t impressed. hhgregg had better deals and I have no pictures to share because I was busy sitting in a massage chair the whole time. It was now about 8:15 and we debated whether we should go back to hhgregg or try a nearby Sears. We knew we were cutting our time close, but we still felt like we needed to shop around so we went to Sears. We entered Sears and it was 5 million degrees in the store. Mike and I have had multiple bad experiences at this particular location (awful customer service when trying to buy garage door openers and appliances), so we were ready to just browse quickly and leave. 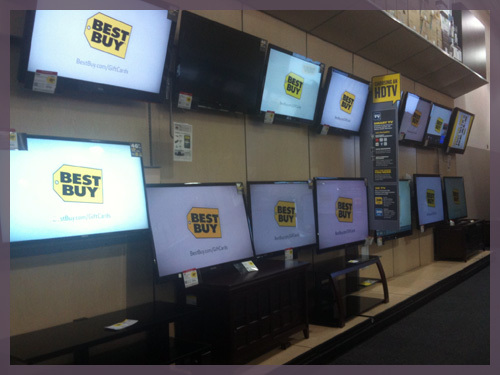 It appeared like they didn’t have much, until we spotted that glorious frameless TV that we fell in love with in the distance. We were simply admiring it, since it didn’t have a price on it, when a salesperson came up to us and told us it was on sale. He also told us he could give us an additional 5%. 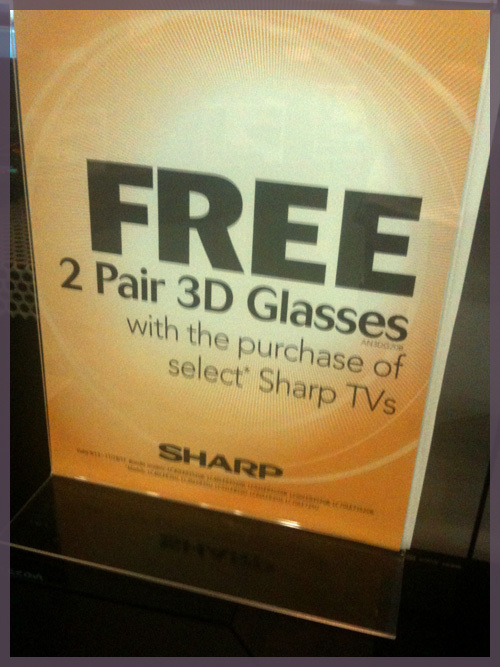 He then told us he could give us 2 pairs of 3-D glasses, valued at $50 each. As appealing as this was, we knew we had little use for 3-D glasses, so Mike asked if we could have more off the price instead. The guy was all like sure! I’ll give you another 5% off! The stats… it’s a 46″ LED. And we’re in love. It is absolutely insane how thin this thing is. Our old plasma took both of us to move. This thing? Mike can grab it with like, one hand. The strange thing is that it’s a larger TV (our previous one was 42″), but it looks smaller because of the lack of speakers and other extra bulk along the front. 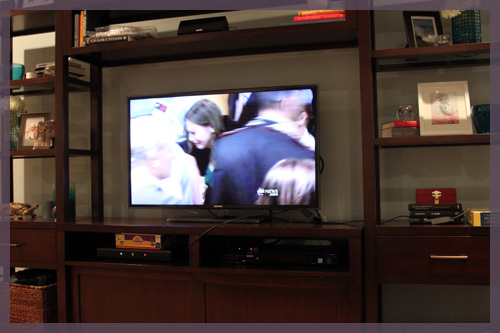 When we put it on the entertainment center we were like, ooh, we could have gone bigger! (I told you we are sometimes irrational) But then we realized that an increase in size equals an increase in price (we’re not THAT irrational). Yay! Glad you aren’t tv-less anymore! What a great deal! I’m so glad you guys found a tv you really liked. Ooooo, I like. I didn’t know about the glass frame. Very cool. We aren’t “normal” blogger people either. Our tv in our bathroom died a month ago. We think it was a lightening homicide. We bought a new one the next day. I can’t miss GMA while getting ready in the morning. Nice work shopping around and scoring a deal! I love the frameless too, so pretty. Nice comparison 🙂 I would much rather have a nice new Samsung TV (both of mine are), than something from Missoni.